Good day, from the many cases I select this one, which seems exemplary to me and where, thanks to Autopathy, the health condition was significantly improved. Also improved was the quality of life and the organism´s immunity and homeostasis was restored. Multiple myeloma is a cancer formed by malignant plasma cells, characterised by overproduction of monoclonal immunoglobine (myeloma protein, monoclonal gammopathy), most frequently of type IgG, then IgA, IgM and eventually others (Bence-Jones protein). The cause for this illness is not known, it occurs more in older age, more often in men. The bone is damaged by increased production of pathological plasmocytes and also by the stimulation of osteoclasts. A patient, 59 years of age, visited my praxis Centrum Revital because of recurring upper respiratory tract infections over the period of 4 months and then in February 2016 the progression of immunodeficiency into bronchopneumonia in both lungs, feeling of extreme tiredness, dull pain in the back – in the area of chest, loins. Classical treatment consisted until this time in medication through broad spectrum antibiotics, vitamins and immunostimulants of the type Bronchovaxom, Ribomunyl, Luivac…, bacteria lysates of the most common pathogens in respiratory diseases. He stopped smoking 10 years ago, drinks coffee 3x a day, invests in properties, sport – cycling, recreational tourism. He has been working daily 12 hours, workaholic and perfectionist. History of the present illness: from November 2015 repeated infections of the upper and the lower respiratory system, medication: 3x broad spectrum antibiotics, slackness, dull and insistent pain in the loins and the thoracic spine. Laboratory tests at the turn of January and February 2016: blood test, biochemical test, urine and sediments, radiography, biopsy of bone marrow, …. diagnoses of multiple myeloma, plastocytoma. In February start of chemotherapy – chemotherapeutic agents, corticosteroids, analgesics, biological therapy. Because of his age, a conservative therapy was chosen and he was told that a transplantation of bone marrow does not come into consideration for him. The first visit in February 2016: he arrived pale, anaemic, chilly, with night sweating, depressive. He did not tolerate chemotherapy well, vomited after each treatment, had stomach pains, tiredness, increased temperature. They learned about autopathy from friends and they chose me, because I am a physician and have been applying also other methods. I was recommended to them in InPharmClinic. I have recommended to him books Get Well with Autopathy and Autopathy, a Homeopathic Journey to Harmony and until the time he had read them, we have applied 1x a week infusions of Vitamin C 15 g + Glutation 1200 mg + a mixture of Vitamins of the group B and amino acids and additionally a medication from FRM – GUNA Rerio, a medicine containing extract from the embryos of the zebrafish (Danio rerio), used as a supplementary form of treatment in general weakening of organism accompanying oncological diseases. Rerio induces expression of tumour suppressor gene and slows down expression of oncogenes. In spite of this, after 3 weeks of application of chemotherapy, the man had to undergo blood transfusion due to reduced blood cell count and the reduced level of thrombocytes, also in the while blood cell line. He also suffered from diarrhoea, large tiredness, malady and depressions. After a month from the beginning of chemotherapy, we added also vitamin C, Glutathione and vitamins and Reria also autopathy. At the start he used 1,5 boiled breath daily and after a week he called that he feels better, less tired, has been sleeping better and is starting to believe that he will be healthy again. He started with autopathy from prana 5 in a second bottle, and this 2 l every second day. After a few days he called me that he sees light at the end of the treatment and that he believes that he will recover and that he had a dream several times that the blood tests were in norm and that he had woken up from a dream, and that he is healthy. He combined autopathy from boiled breath 1x a week with non-boiled breath 2 l, and the second month (in April) his temperature increased for a few days up to 38°C. However, he did not have any symptoms as in virus infections or colds, on the contrary, he felt more energy. At this time he also got aphthae in his mouth and painful corners of the mouth. I recommended changing to autopathy from boiled breath 2 l daily and should he not have time, then every second day. The aphthae in the mouth disappeared after a few days, the corners of the mouth healed and he tolerated chemotherapy cycles better. Generally, autopathy from breath agreed with him better. At the end of the expiration date of the bottle I recommended 2x – 3x applications of autopathy from boiled blood. The other blood tests were considerably better in all parameters, anaemia only minimal. Hair loss stopped, although in view of his generally thinned hair, he decided shaving his head completely, and although he was afraid of it, getting rid of the hair did not bother him. He continued applying autopathy from prana 5 – 2x till 3x a week, 3 l. He felt psychically stabilized, stopped losing weight and maintained his weight and the doctors told him that has been tolerating the chemotherapy exceptionally well. In July the physicians allowed the possibility of transplantation of the bone marrow after the chemotherapy had been completed. 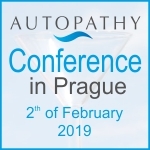 After 3 months, we continued with autopathy in new bottles – in one autopathy from prana 5 gradually increasing according to how he felt towards the end of the ½ treatment. In August he was to make autopathy from prana according to own feelings, 1-3x a week, gradually increasing quantity of water till 5-6 l and in the second bottle we continued with boiled breath again, always after a week non-boiled breath, gradually till 8 l, 1x till 2x a week. He continued going 1x a week for infusions of vitamin C15 g, Glutathion 1200 mg and a vitamin complex of the group B and amino acids and additionally he has been taking alkalizing mixture of minerals ProBalanc or an equivalent from DM chemists Base plus and a medicament with the fungus Penicilinum Oxalicum with selenium and glucan – Speratol. In August 2016 he was included in a transplantation program and in the first week in September he had undergone the surgery implanting the bone marrow from his younger brother. He was placed for 3 weeks in a sterile box in a sterile room of the Haematology department. The surgery was without complications, the adaption of the organism as well – and according to the information from his wife in October 2016 he felt good and was returning fully back to life. All this time he had 2 new autopathy bottles with him. I recommended prana 5 to stimulate the vitality of his organism, rather lower potencies – till 5 l, according to his feeling, and eventually also autopathy from non-boiled saliva or non-boiled breath – also until 6 l.
He adapted himself well all the time, without complications, the transplantation of the bone marrow was successful and the man did not feel tired He was only bored, and so he had enough time to read. He had read also the second book about autopathy, and he also had books from Dr. Frank Kinslow about quantum physics, books by Eric Pearl about reconnective healing, The Power of Now by Tolle, and other books. He said that under normal conditions as a healthy person he would have never read such „hotchpotch“. However, generally, the illness opened his eyes and pushed him several stages forward, as he says. He stopped worrying, solving unsolvable, and he lets everything flow by, becoming an observer. At the end of October he got a new grandchild and according to a telephone report, he has been feeling good, has a lot to do, The laboratory tests are in order, the bone marrow was accepted, is not tired, and during this time he supplements vitamin C and other phytonutrients, vitamin and mineral complexes, in oral form. He still uses autopathy, either boiled or non-boiled breath and prana 5, potency till max. 8.1. and this suits him. He feels completely healthy and without problems, he enjoys his life and is happy that his oncological problem has forced him to rethink life values and to slow down. His hair has grown again, he enjoys his life and returned to entrepreneurship. Autopathy became a part of his life and he follows intuitively the form and the potency of autopathy. We sometimes speak together on the phone and inform each other about what is new and he consults me.